In 1944, celebrated Japanese filmmaker Akira Kurosawa’s directed the film “The Most Beautiful”. The film centers around the lives of school aged Japanese girls who have left their families to go work in factories to create war materials for the Japanese army. The central plot of the film focuses on the girls attempting to fill a work quota. The work quota was given to them after they demanded at the beginning of the film that their work quotas be increased. Yes, increased. 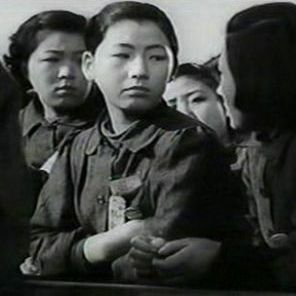 The following is a clip from the scene after the Tsuru, the "president of women workers", takes the workers' demands to the factory bosses. This is the overall story arc. The subplots are equally absurd. One girl injures her leg while doing chores, her family is then contacted and she is forced against her will to return home to heal. She wants to work not spend time with her family! At the climax of the film, Tsuru realizes that she may have made a mistake while aligning scopes intended for use in Japanese fighter planes. The scopes are very expensive and since the misaligned scope has been mixed in with dozens of other scopes and there is no way of knowing which one is misaligned without carefully inspecting all of the scopes. The work is painstaking and will require her to work all night to fix the problem. However, despite the arduous nature of the task, she is able to complete it because she is inspired by the idea that her scopes will be used to kill American pilots. It is easy to point to modern day examples of propaganda that are just as obscenely militaristic and pro-work. However, propaganda has evolved since this 1944 primitive format. It is now vastly more complex. While some movies, such as Michael Bay’s “Transformers”, or “Battleship”, still openly celebrate militarism, many movies and TV shows may hint at the vulgarities of patriotism and work while failing to offer any steps that the audience can take to alter the current state of affairs. So the hit TV show “Mad Men” may have an underlying theme of work being a miserable activity, but the alternatives to work examined in the show are portrayed as equally distasteful. This in turn reinforces the idea that work and militarism are unchangeable facts of life, another form of propaganda. And while there is no punishment for those who sheepishly celebrate work and American hegemony, the punishment for those who dare to meekly attempt to give praise to America’s enemies are given no quarter. Ali al-Bahlul, 40, was given a life sentence in Guantanamo Bay for creating al Qaeda propaganda. “The key evidence was a two-hour video he made by splicing fiery bin Laden speeches with Muslim bloodshed and stock news footage of the aftermath of the October 2000 suicide bombing of the USS Cole off Aden, Yemen.”1 Al-Bahlul in his own much less nuanced way did something very similar to what Kurosawa did 70 years ago. He still languishes in Guantanmo Bay. Thankfully, the same punishment was not given 70 years ago to Kurosawa. 1. Rosenberg, Carol. "ZCommunications » Chomsky’s book “Interventions” Banned at Guantanamo Bay & other prison camps." ZCommunications. http://zcomm.org/znetarticle/chomskys-book-interventions-banned-at-guantanamo-bay-and-other-prison-camps-by-carol-rosenberg/ (accessed October 17, 2014).